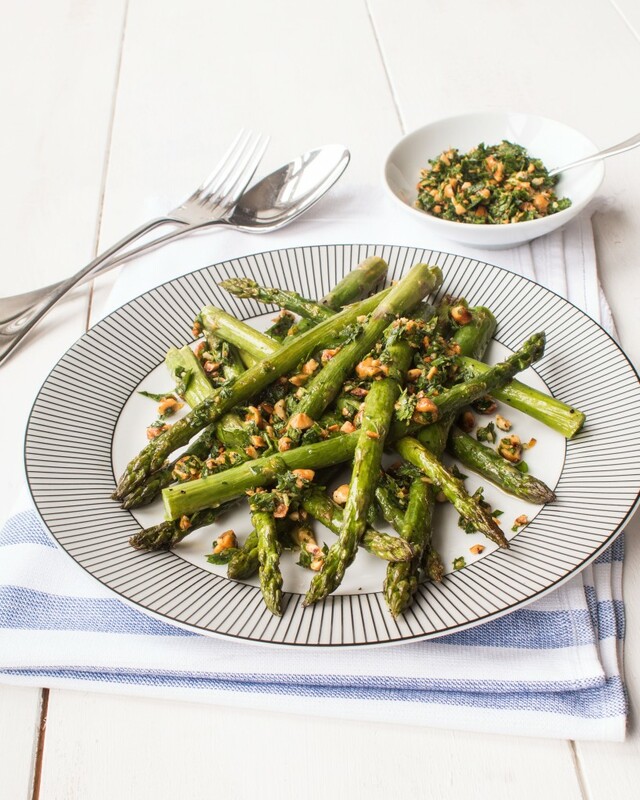 Top roasted asparagus spears with crunchy hazelnuts, parsley and lemon for a real winner. For an added extra, crumble over some feta. Place the hazelnuts on a small roasting tray and place in the oven for 5-7 minutes until golden brown. Keep an eye on them to make they don’t burn. Once browned set aside. 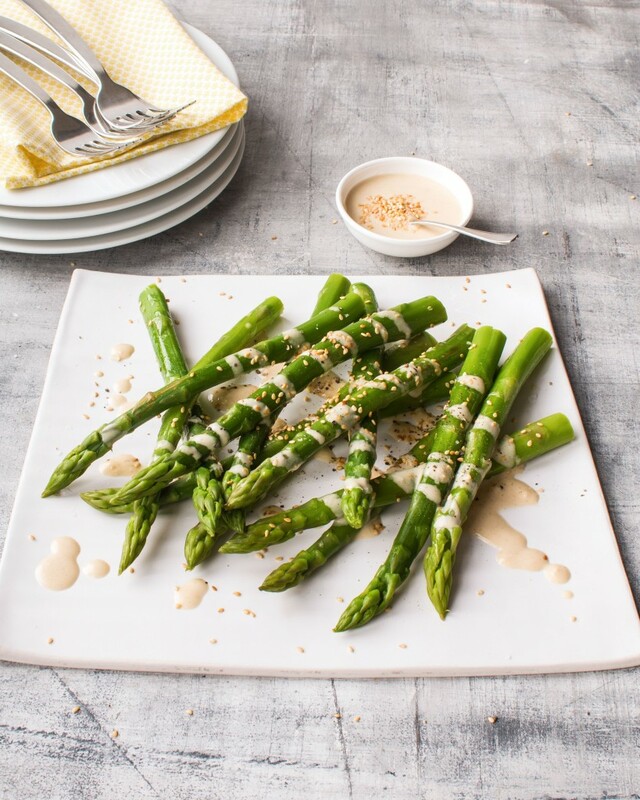 Trim off any woody ends from the asparagus and place in a roasting tray. Drizzle with the olive oil and season with salt and pepper. 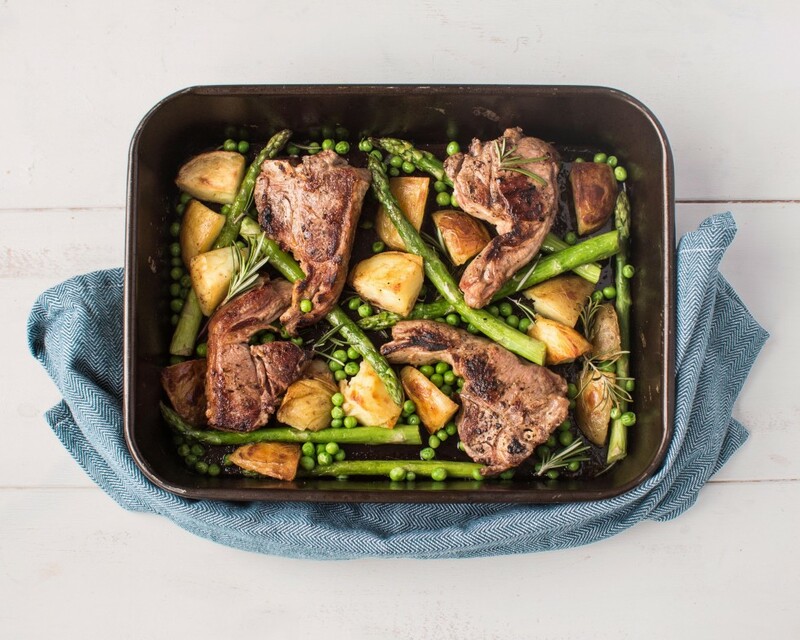 Roast in the oven for 5-6 minutes until crisp but still tender. Meanwhile, coarsely chop the roasted hazelnuts and parsley and place in a bowl along with the lemon zest and crushed garlic. Slowly drizzle in 1tbsp olive oil and stir to combine. 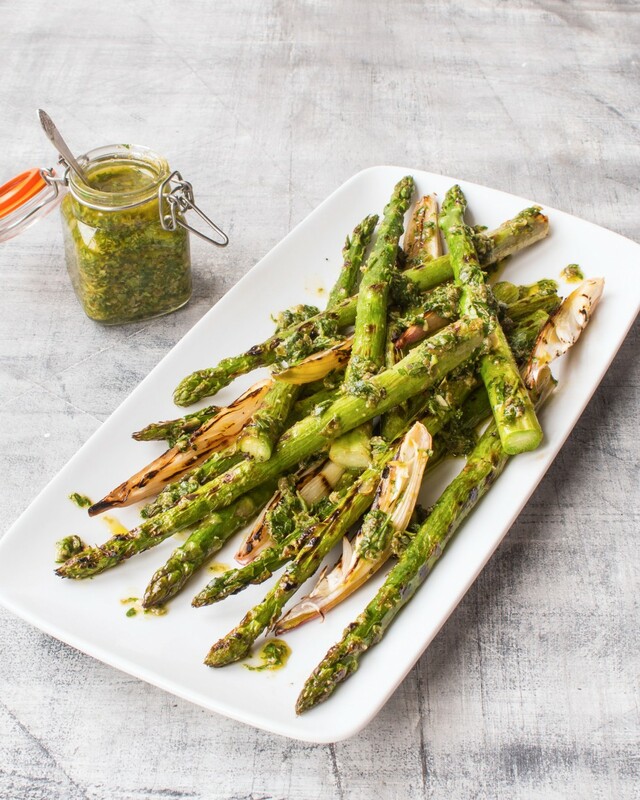 Once the asparagus is done, place on a plate and top with the gremolata and enjoy. 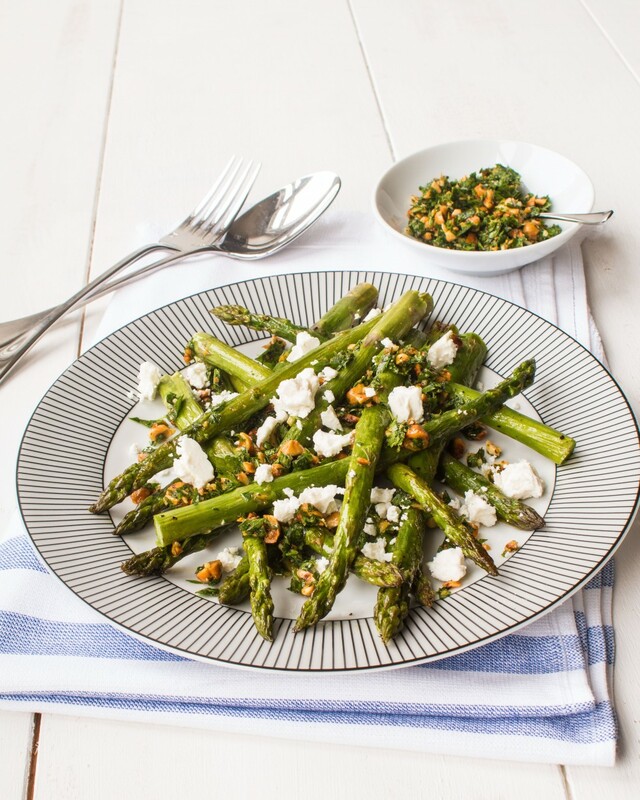 Once the asparagus is done, place on a plate and top with feta and gremolata, season and enjoy. 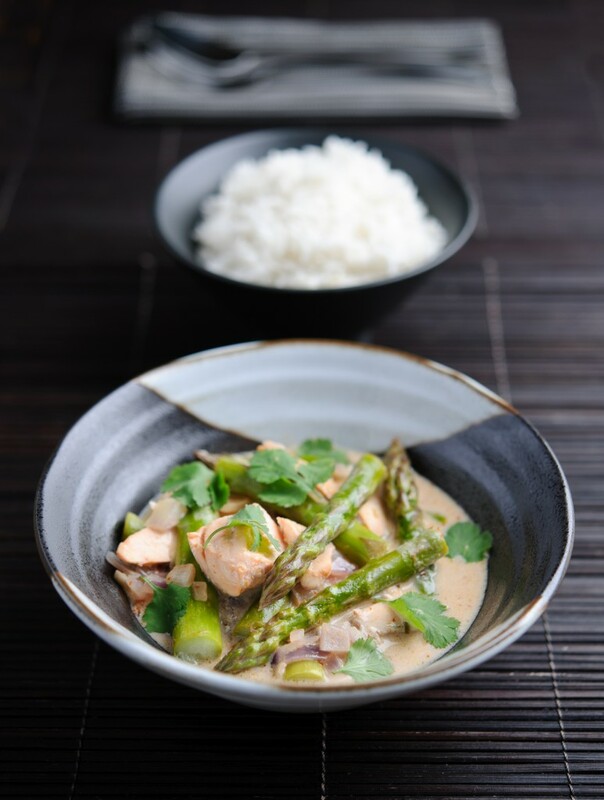 This Asian dish has been given a British twist by adding salmon and British asparagus in this fragrant curry. 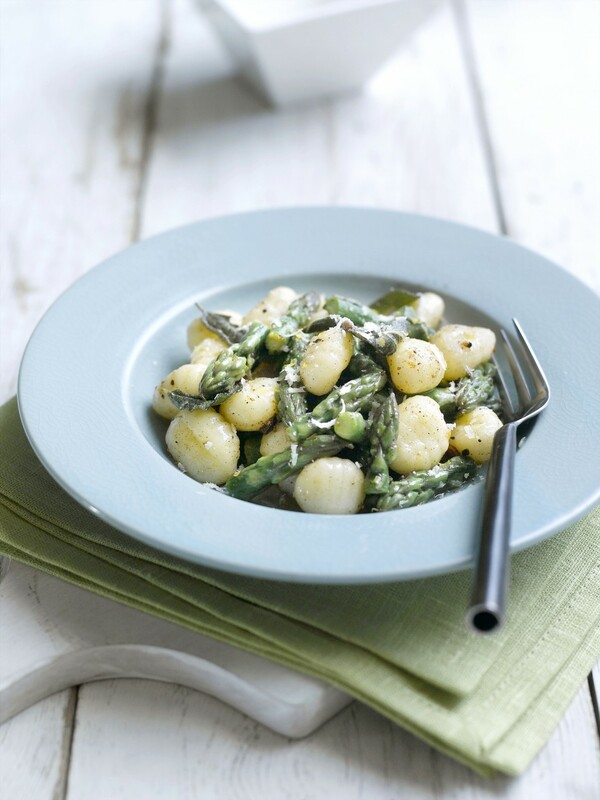 If you want to be more economical or are a vegetarian then add plenty of summer vegetables with your asparagus. Place the oil into a wok and on a medium heat, then add the garlic, red onion and curry paste and cook for a couple of minutes until everything is smelling fragrant. Add the salmon and stir well so it soaks up all the flavours. Then gradually add the coconut milk and fish stock. 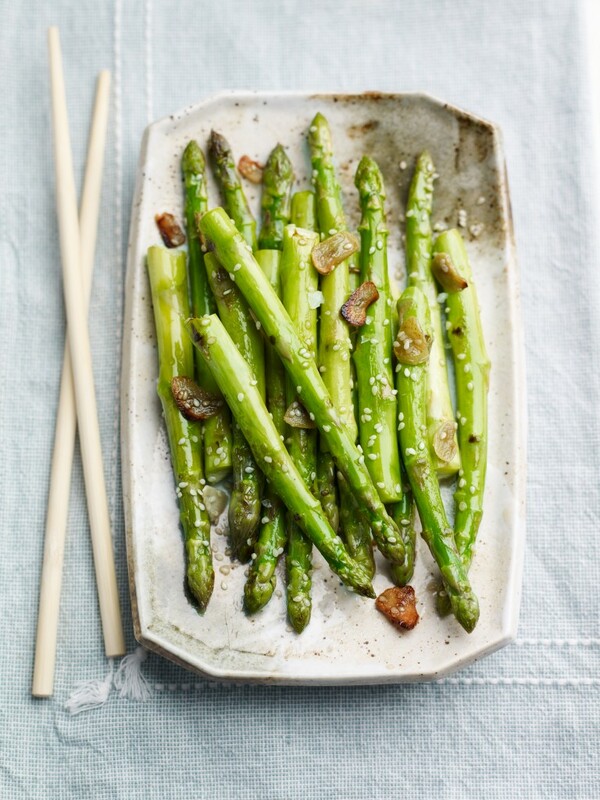 Follow with the fish sauce, sugar, lemon juice and British asparagus and then the lime leaves. Cook gently for 10-15 minutes, taste and adjust seasoning. Finally add coriander leaves and serve with rice. 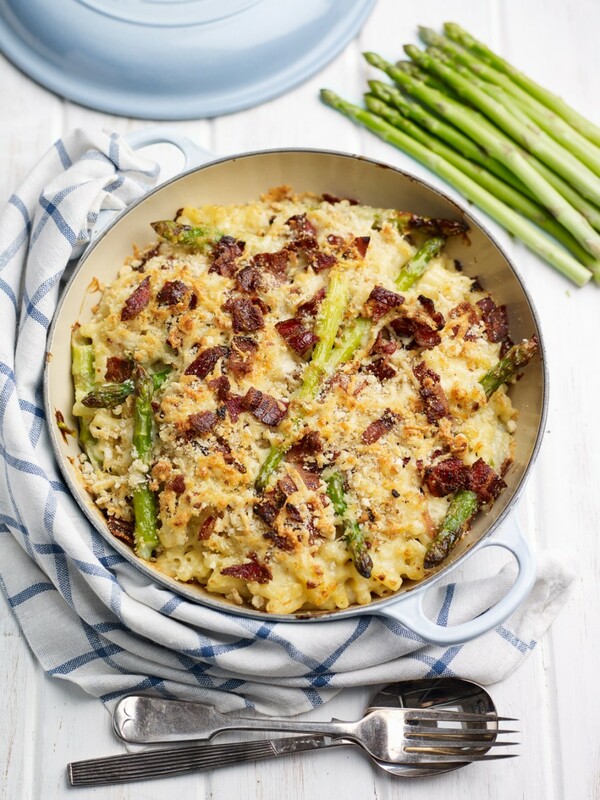 A hearty one pot meal for all the family to enjoy, delicately spiced so as not to mask the flavour of the asparagus. 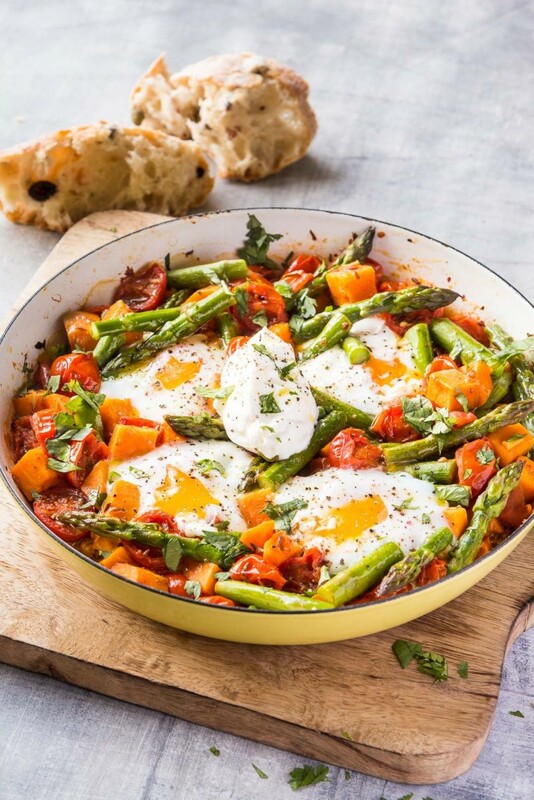 One pot cooking equals less washing up. Happy days! Melt the butter in a large pan then add the onion, garlic, thyme and spices and cook for 5 minutes until softened. Add the rice and cook for a further minute, then pour the hot stock into the pan, cover with a piece of tin foil and place on a tight fitting lid. Cook over a low heat for 25-30 minutes. 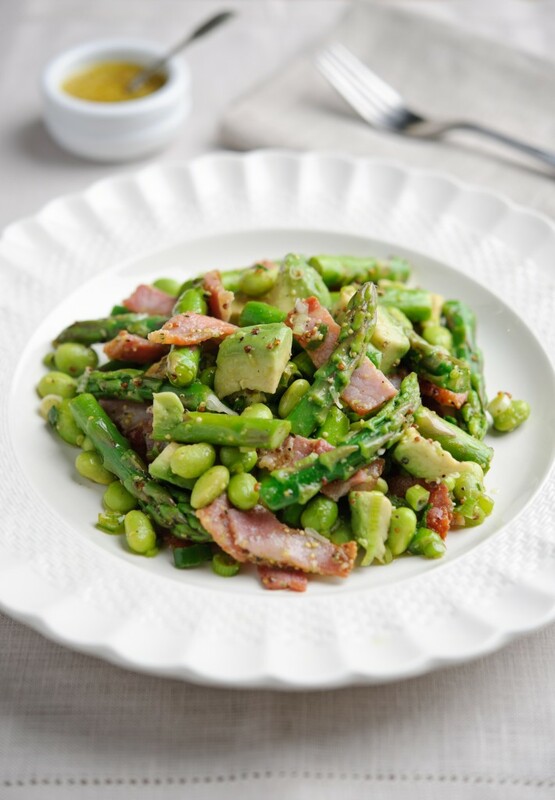 The combinations of flavours in this salad are sumptuous. 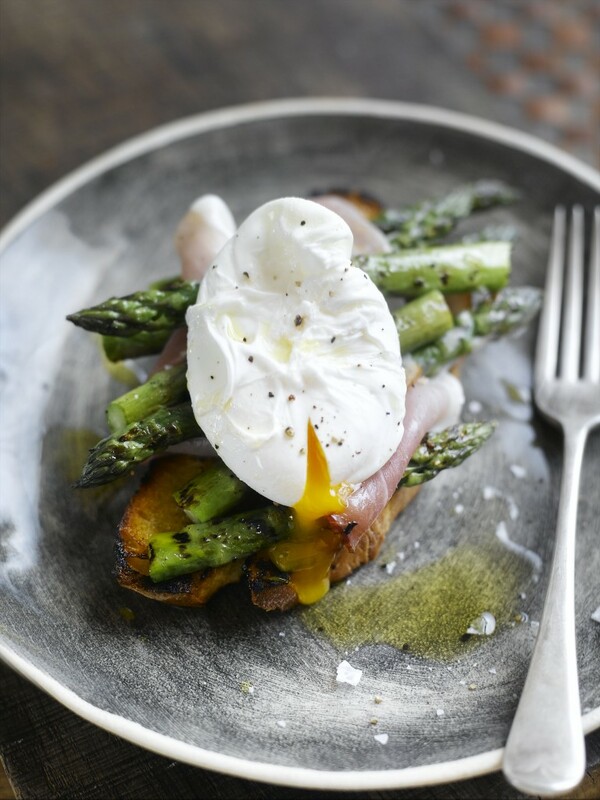 The peppery heat from the soft rare tuna works well with the softly roasted asparagus and then the runny yolk blends in beautifully. 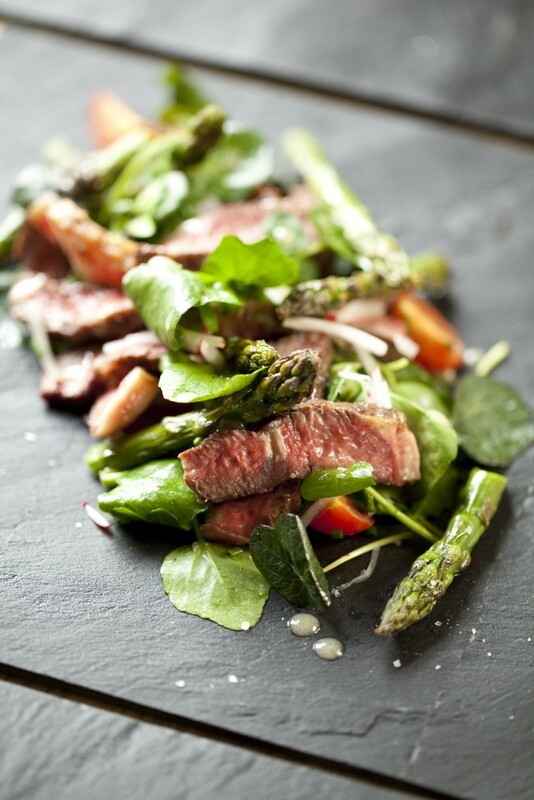 A gorgeous salad for sharing and diving into with hands. Pre-heat the oven to 190°C. Place the British asparagus into a baking tray, drizzle with a teaspoon of olive oil and add the chopped green chilli. Put in the oven for 8-10 minutes. Take the tuna steaks and rub them with the crushed black peppercorns to form a pepper crust. Meanwhile place the grill pan on the heat and add a tablespoon of olive oil and wait until it heats up. Also bring a pan of water to the boil for the eggs. Add the tuna steaks to the hot grill pan and cook for 2 minutes on both sides for rare steaks. When cooked leave them to rest for a few minutes. Meanwhile, drop the eggs into the boiling water and cook to your taste, 3 ½ minutes for soft boiled or 7 minutes for hard. Whilst they are cooking you can assemble the salad. 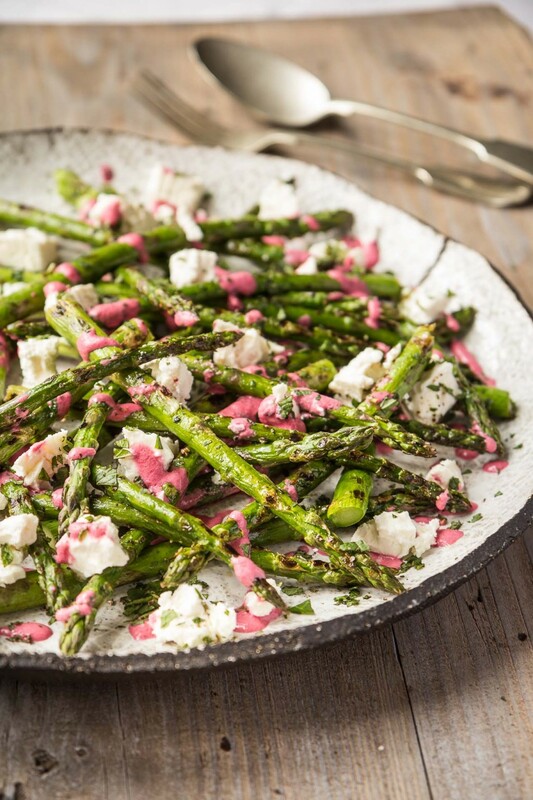 Place the salad leaves on a plate and then follow on with the British asparagus spears. 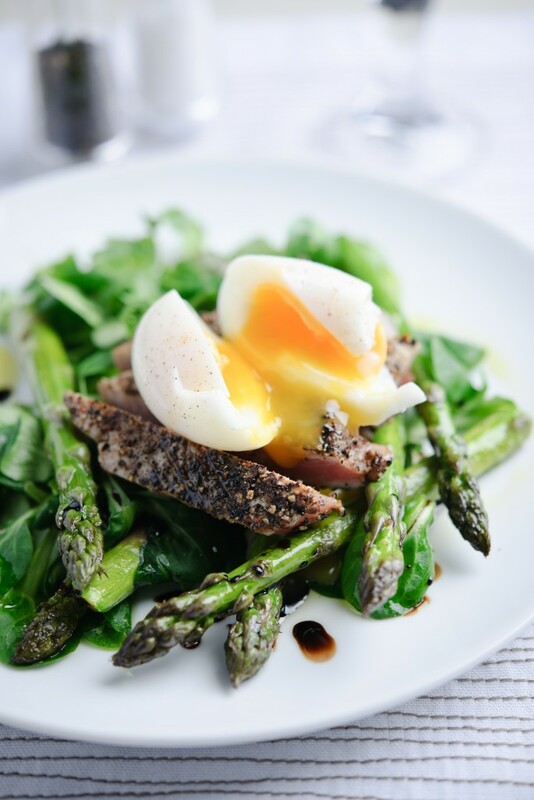 Slice the tuna on the diagonal and lay over the British asparagus and salad. Remove the eggs from the pan with a slotted spoon, and under running water peel them. Then halve and place the soft egg around the plate. Season well with the olive oil and balsamic and enjoy. 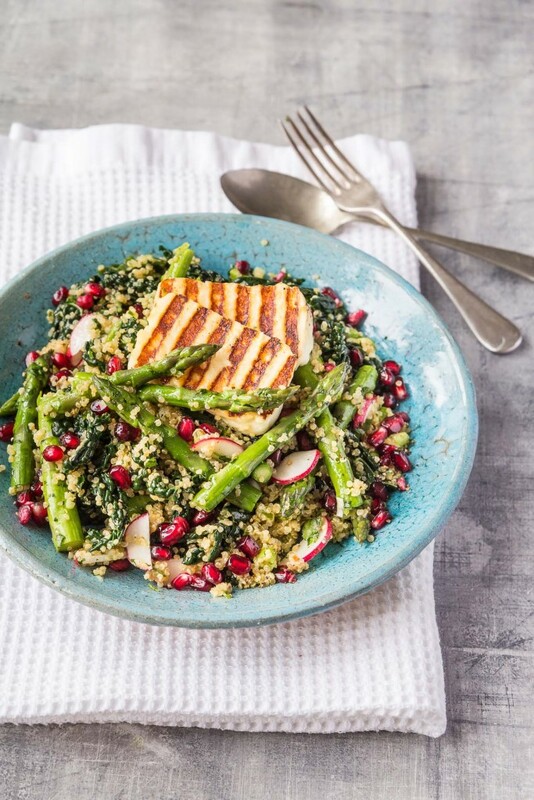 Wash the quinoa thoroughly then place in a saucepan with 360ml of cold water, bring to the boil then reduce the heat and simmer gently for 10 minutes. 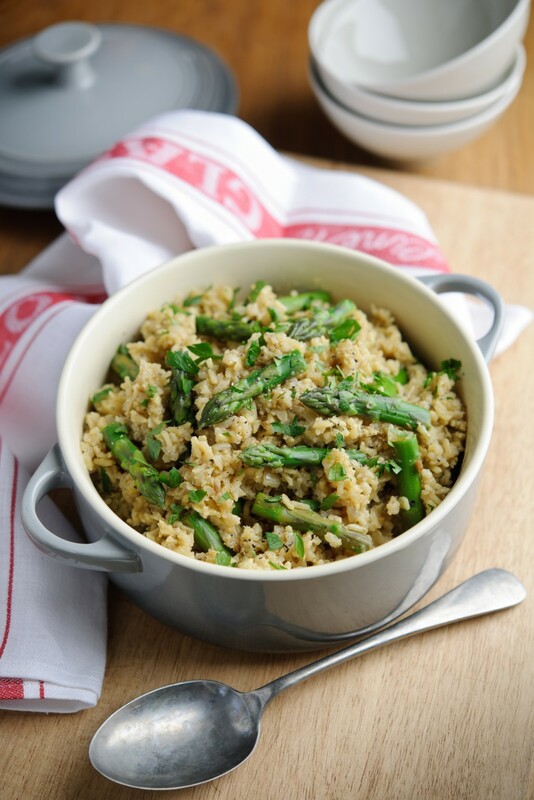 Add the asparagus to pan with the quinoa in and continue to cook for 5mins or until the asparagus is tender and all the water has been absorbed. Set aside to cool. Transfer the quinoa and asparagus into a large bowl. 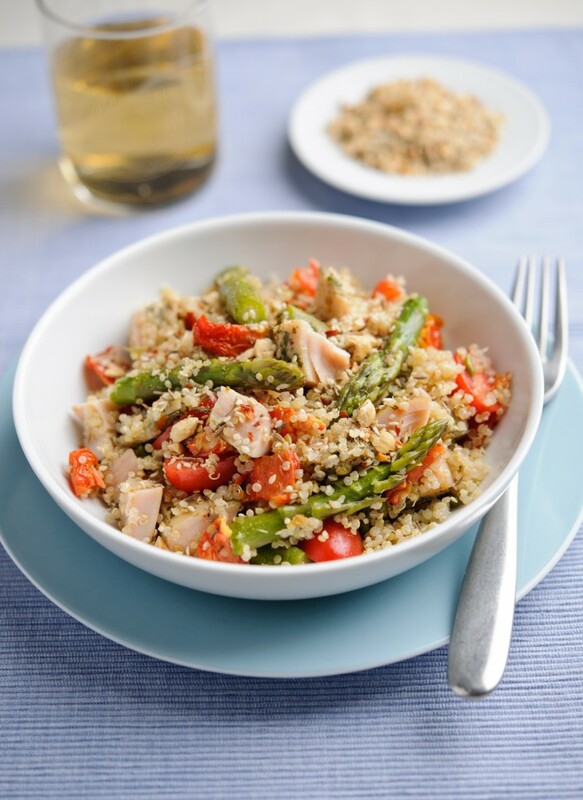 Stir in the chicken, fresh and sunblush tomatoes. Season to taste and garnish with a sprinkle of Dukkah. 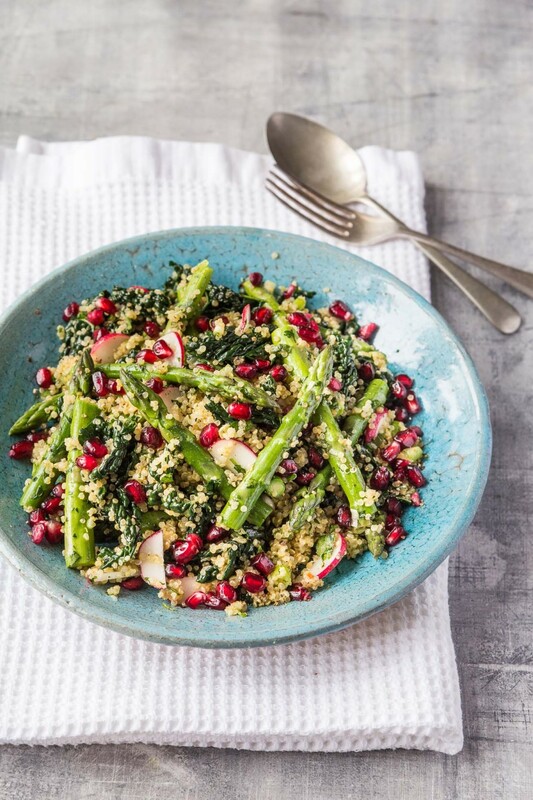 This warm salad has an added protein boost from the quinoa while the British asparagus and kale keep things fresh. 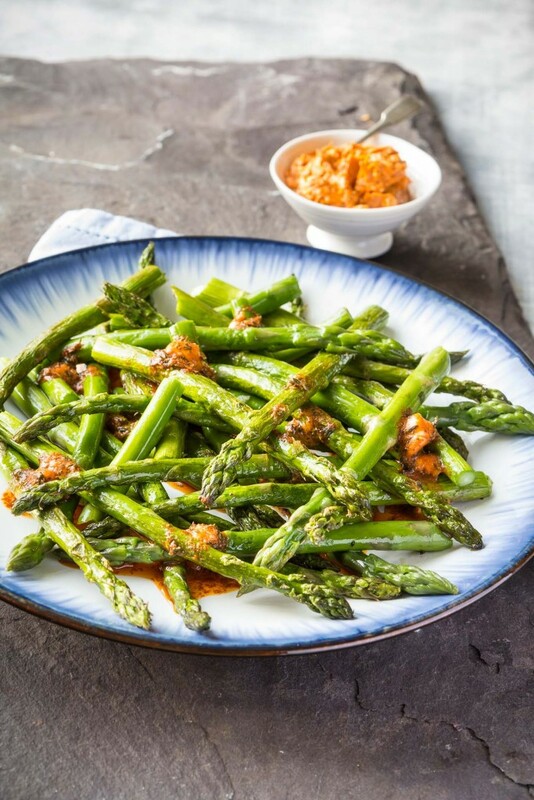 The asparagus is boiled only briefly to make sure it keeps its bite. If you are serving with halloumi, heat a griddle pan until really hot. Brush the halloumi slices with a little oil and grill on both sides until lightly charred and crisp. You may need to cook in batches depending how big your pan is. 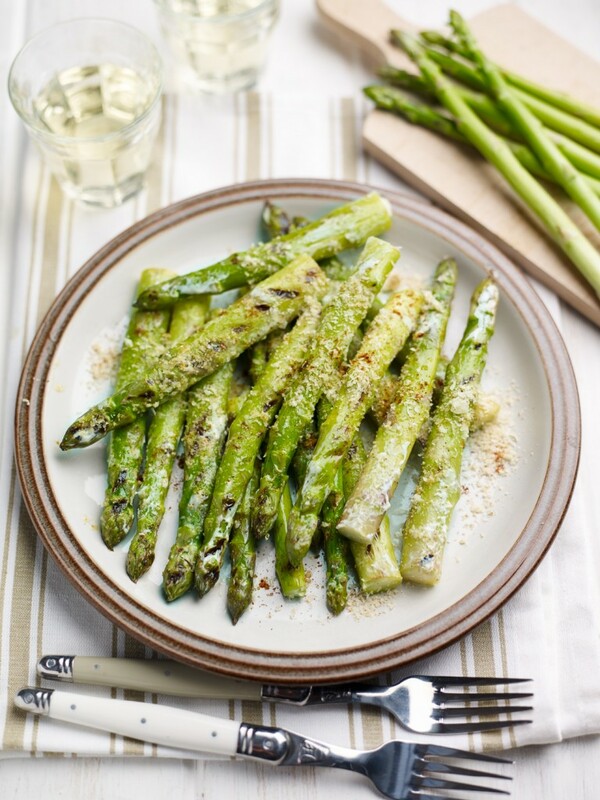 Simply roasted British asparagus spears topped with a butter whipped up in moments. Great for sharing. Add the stock to the same saucepan and set over a high heat to bring up to the boil. Once boiling, slowly pour in the polenta, stirring constantly so no lumps form. Reduce the heat to medium low and continue to cook, stirring all the time, until its really thick – about 5 minutes. Take a little care as it does have a tendency to spit molten bubbles. 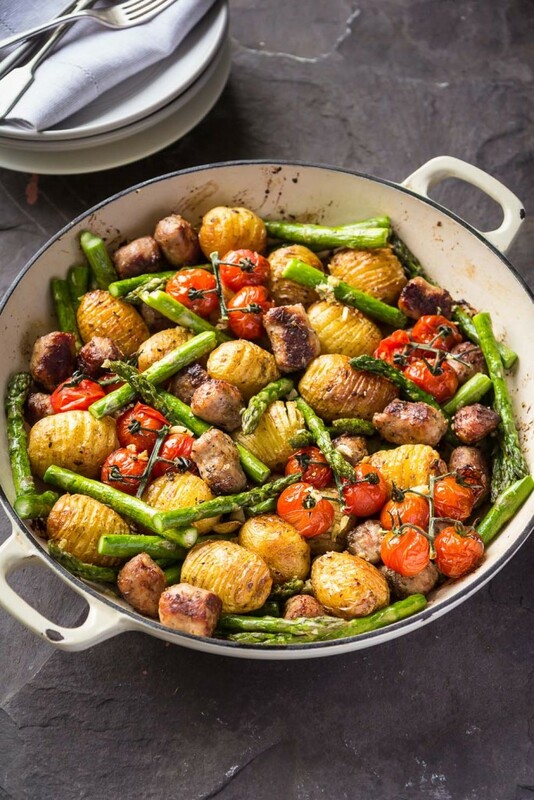 An easy one pot dish that pairs seasonal superstars British asparagus and new potatoes with easy sausage meatballs and juicy vine tomatoes. Using a sharp knife, make a series of thin slices (about 2mm apart) all along the new potatoes, cutting down about three quarters of the way through so the potatoes stay intact at the base. Add to a large roasting tin and drizzle over the olive oil, sprinkle on the oregano and season with salt and pepper. Toss about to evenly coat. Roast for 10 minutes. Cut each sausage into 4, peeling away and discarding the skins as you go. Remove the potatoes from the oven, scatter around the sausage pieces and slide back into the oven for another 15 minutes. Remove the roasting tin from the oven once more, scatter over the tomatoes and the garlic and toss to coat, turning the potatoes so they are all cut side up. Slide back into the oven and roast for another 10 minutes. Finally, add the asparagus to the tin, tossing to coat and roast for 5 more minutes. Set a griddle pan over a high heat to get really hot – this will take a good 5 minutes. Tip the asparagus into a mixing bowl and drizzle over the olive oil, seasoning with a little salt and freshly ground black pepper. Spread out on the griddle pan and cook for about 5-6 minutes, turning regularly until lightly charred and just tender. You may need to do this in batches depending on the size of your pan. 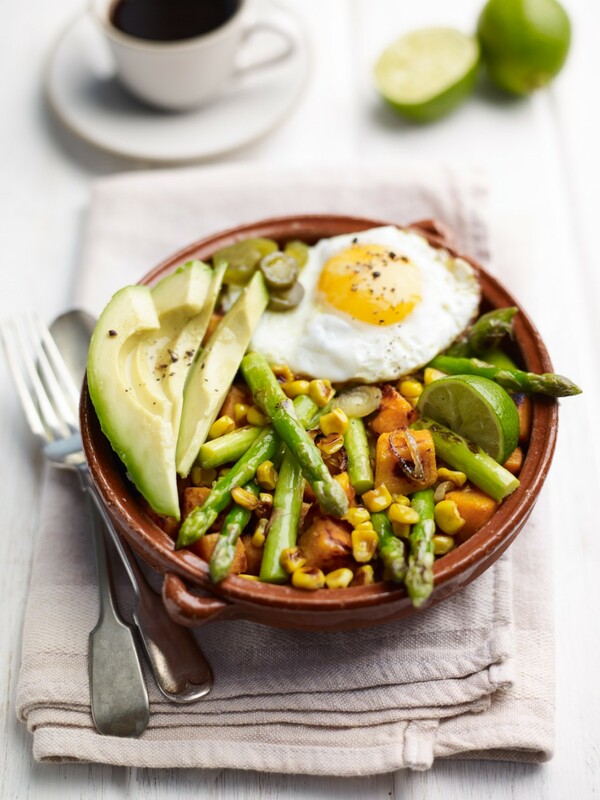 This wholesome brunch dish is packed with nutrients and energy thanks to the asparagus and sweet potato. 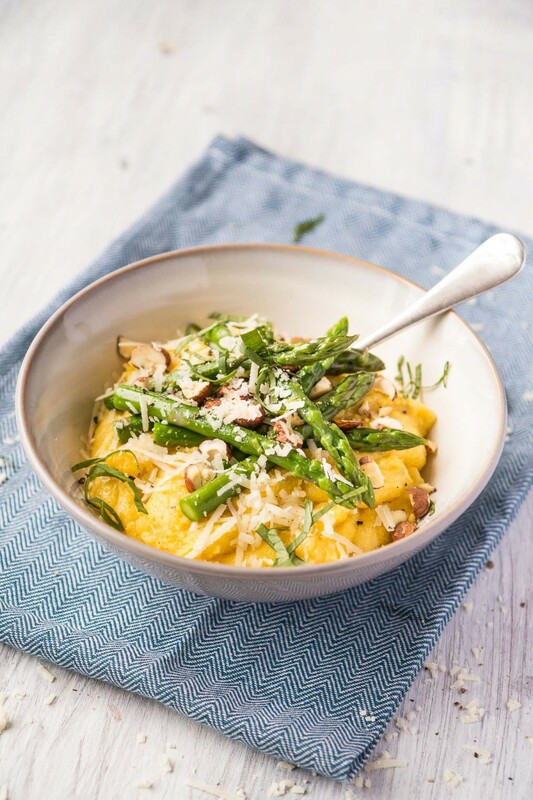 An easy one pot that will keep hungry crowds happy. Add the cumin and chilli to a frying pan and set over a medium-high heat to toast for a couple for minutes. Once the spices are fragrant, pour in the oil and add the sweet potato cubes, stirring well to mix. Reduce the heat to a minimum and cover the pan with a piece of tin foil (or a lid if you have one). Leave to cook for 10 minutes, stirring once or twice, until the sweet potato is just starting to soften. Remove the foil, add the garlic and stir through, then fry for a minute. Turn the heat up a little, add the tomatoes and a little salt and pepper and fry for another 5 minutes, stirring occasionally. 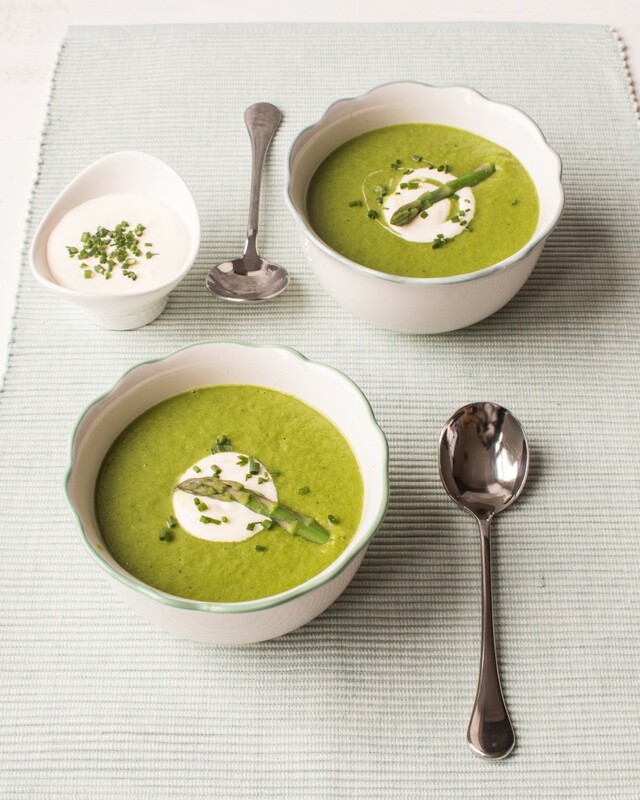 Stir through the asparagus, recover loosely with the foil and cook for another 5 minutes. 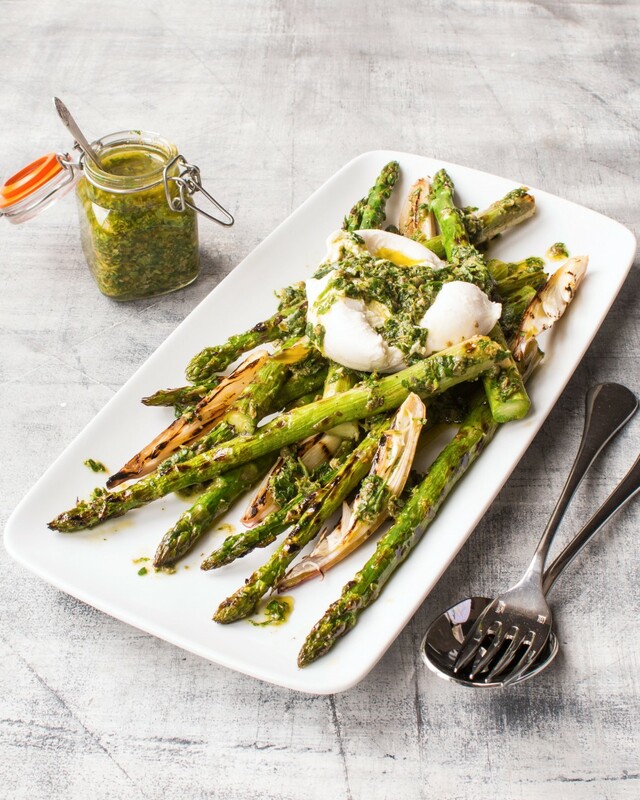 Use a wooden spoon to push the vegetables aside to make 2-4 wells in the asparagus mix, cracking an egg into each. 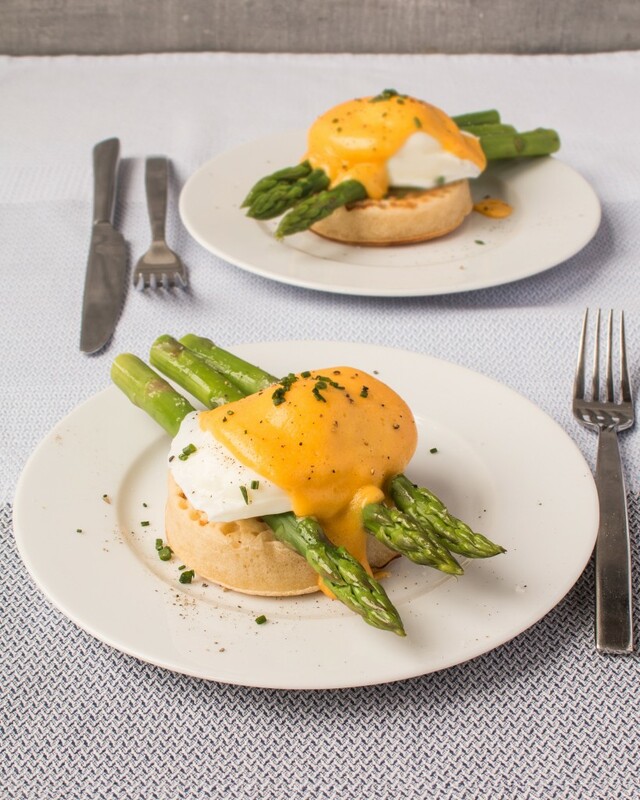 Recover loosely with the foil and leave to cook until the eggs are done to your liking, about 5-8 minutes for a set white and a runny yolk. 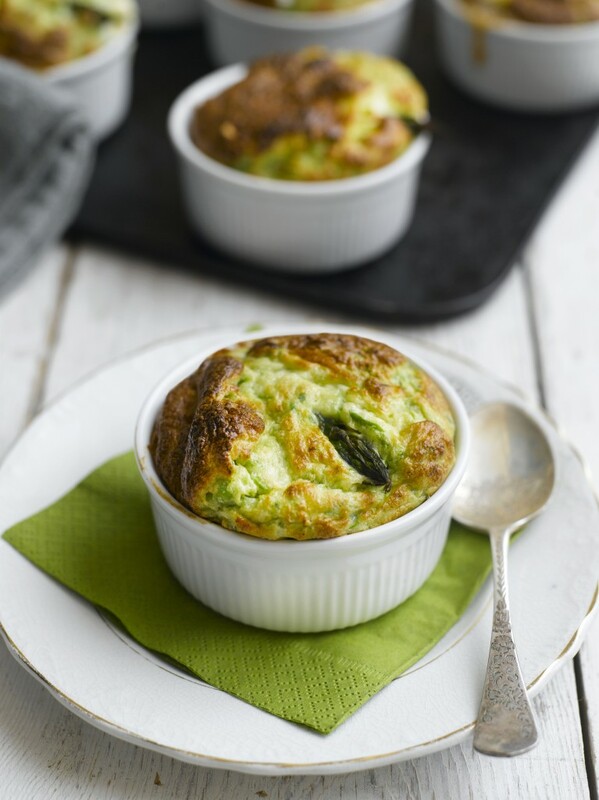 Season with salt and black pepper, scatter over the coriander, top with a dollop of Greek yogurt and a drizzle of extra virgin olive oil. 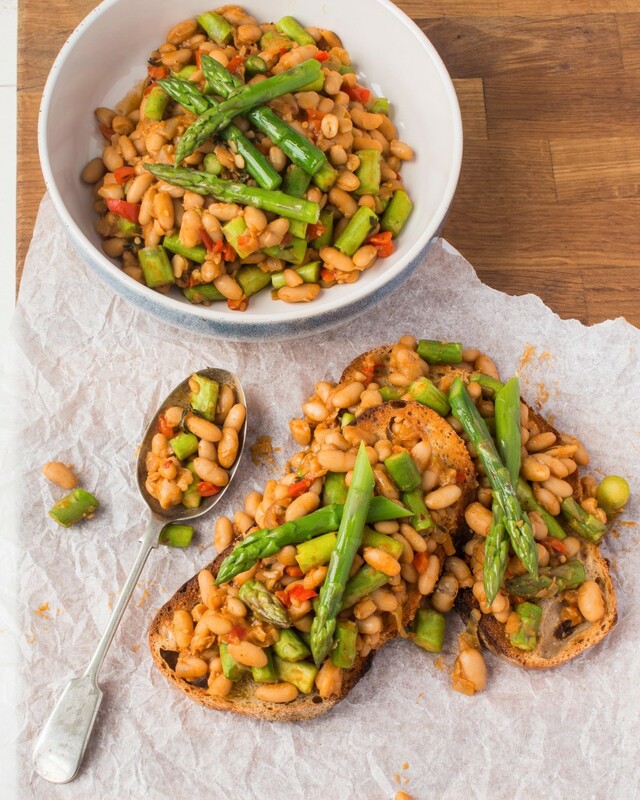 Serve immediately with plenty of crusty bread. 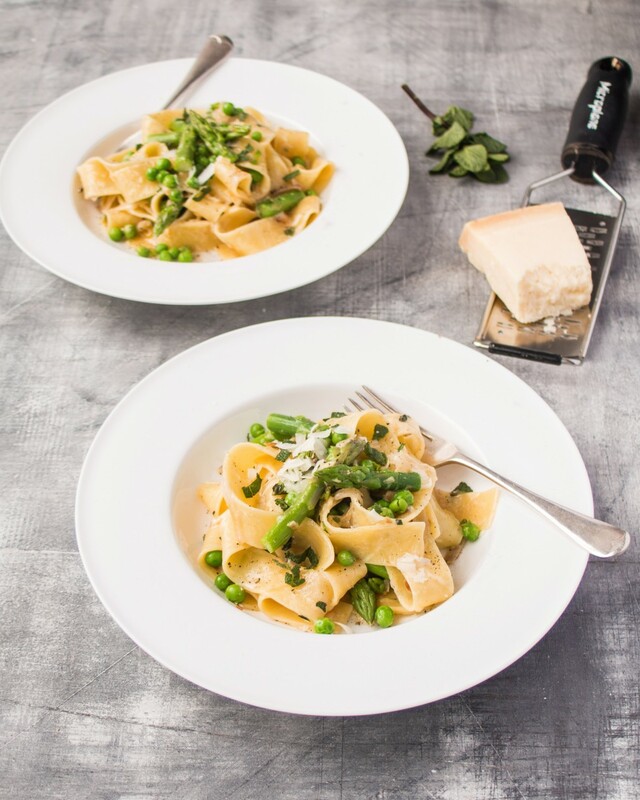 Use a vegetable peeler to ribbon the carrots and asparagus spears then cut the radishes into thin slices. Combine the rapeseed oil, lemon juice and honey, season and beat well to combine. 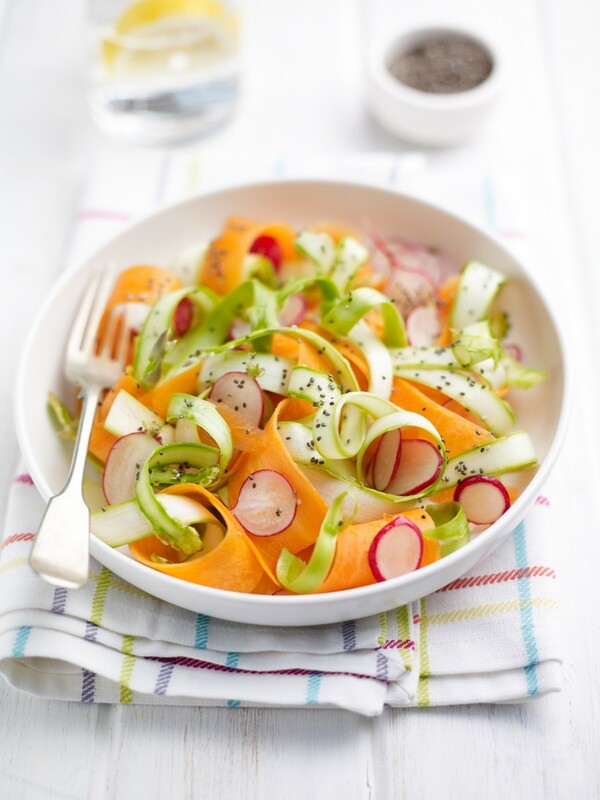 Toss the veg in the dressing and sprinkle with chia seeds. Put the potatoes and oil into a large oven dish and toss to coat well. 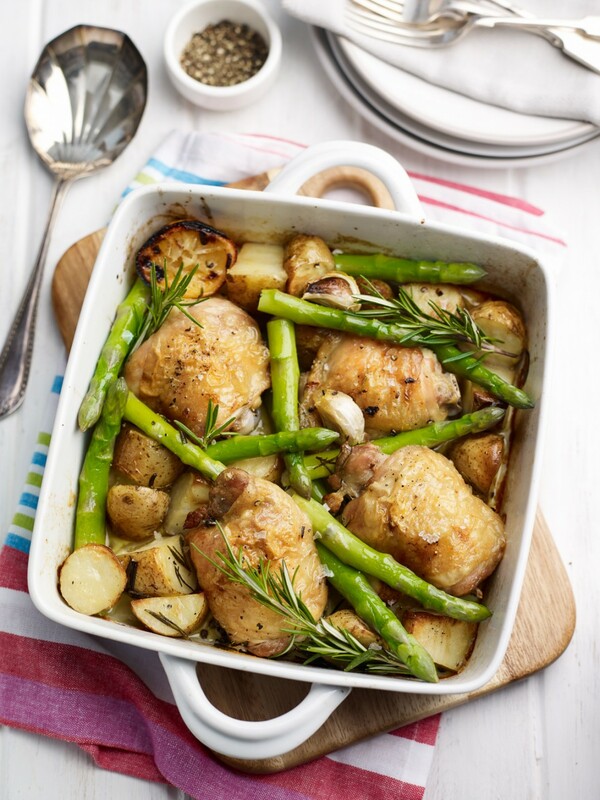 Tuck the chicken in amongst the potatoes and do the same with the garlic and rosemary. 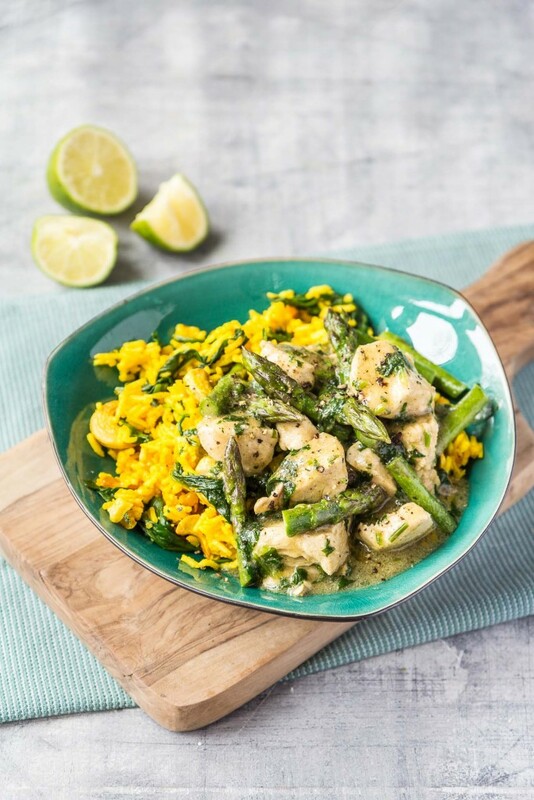 Drizzle with the juice of half the lemon and add the squeezed lemon to the pan. Season well and roast for 50 minutes. After 50 minutes toss the asparagus into the pan and give it a shake so the spears nestle in amongst the cooking chicken and potatoes. Cook for a further 8 minutes. Check that the chicken is cooked and the veg is tender. Pick out the roasted garlic and squeeze the now melting centres into a small bowl, add the juice from the remaining lemon and season. Use a fork to mix the dressing and mash the garlic. Tip the chicken and potatoes onto a warmed serving plate and drizzle over the dressing. 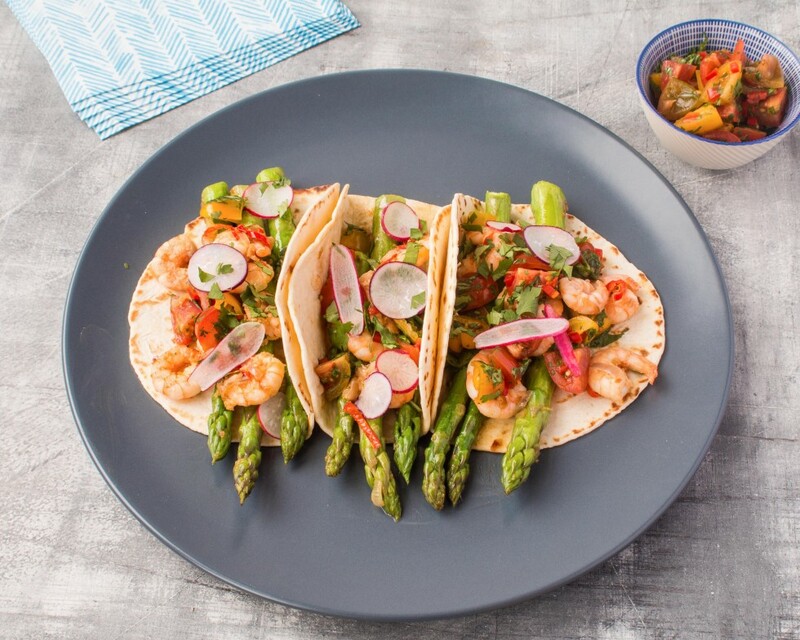 Tip: This recipe is easily doubled or halved. 500g butternut squash, peeled and chopped into bite size pieces. Heat the oven to 220C/200C Fan. Toss the squash, oil, cumin, chilli and a pinch of salt in a large oven tray and roast for 25 minutes. Meanwhile rub the ginger over the salmon and drizzle with honey. After 25 minutes add the asparagus and salmon to the pan and cook for a further 10 minutes. 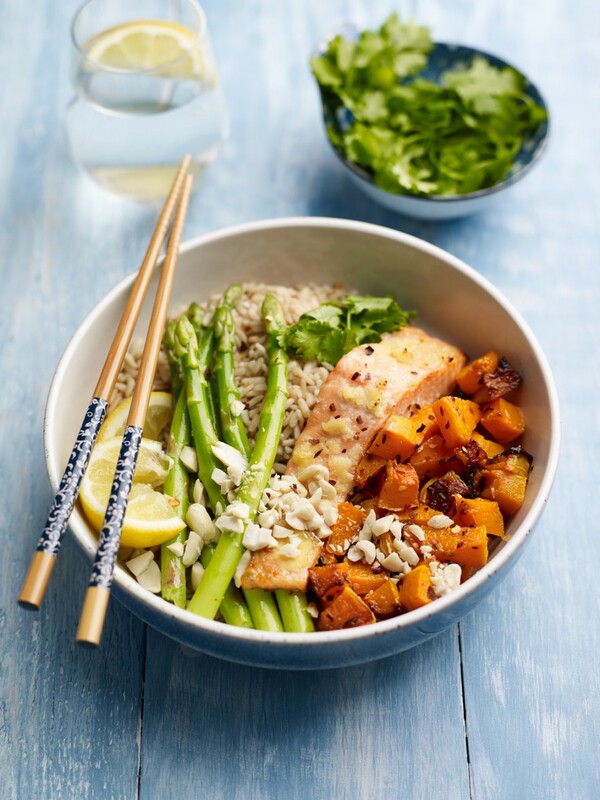 Once cooked put the squash, asparagus and rice in a bowl, top with a salmon fillet, the chopped peanuts and coriander. Squeeze a little lemon over everything. Meanwhile steam the asparagus for 5-6 minutes until just soft. 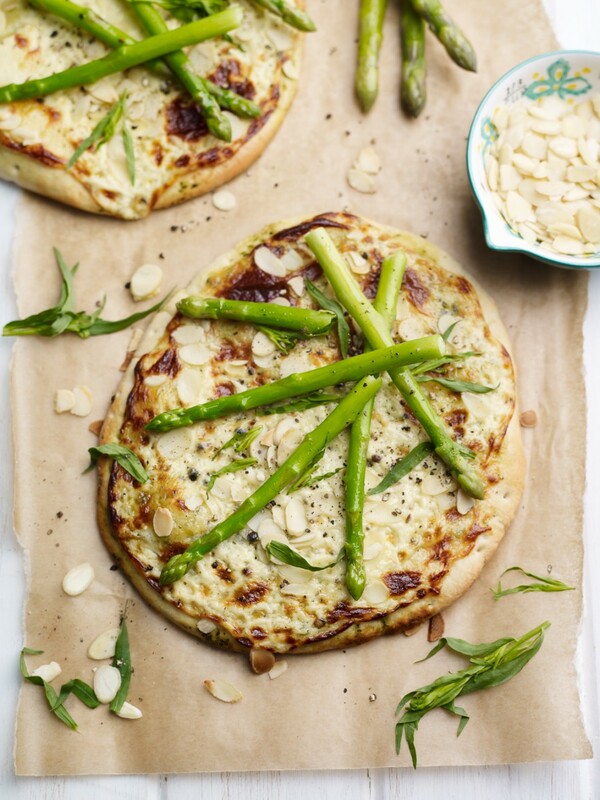 Top the flatbreads with asparagus, add torn herbs and a few parmesan shavings. Heat the grill to high. 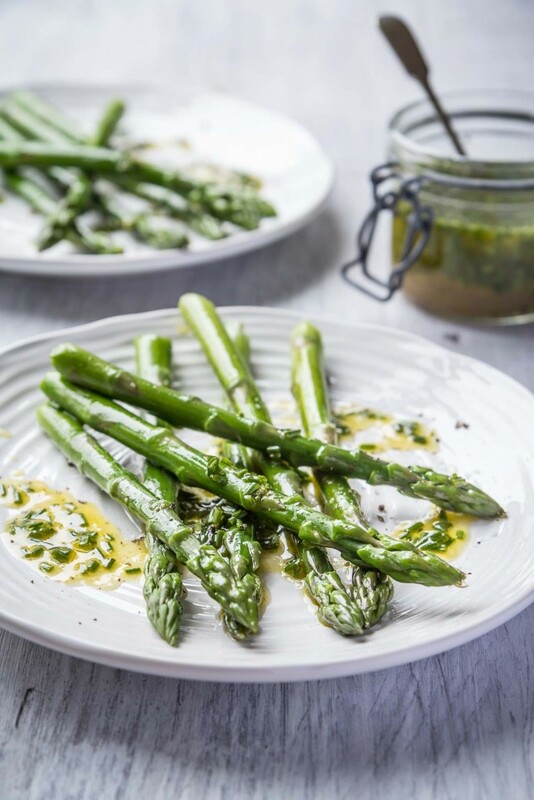 Lay the asparagus spears on a large plate, drizzle with oil, a squeeze of lemon juice and season then shake the plate to roll the spears until they are well coated. 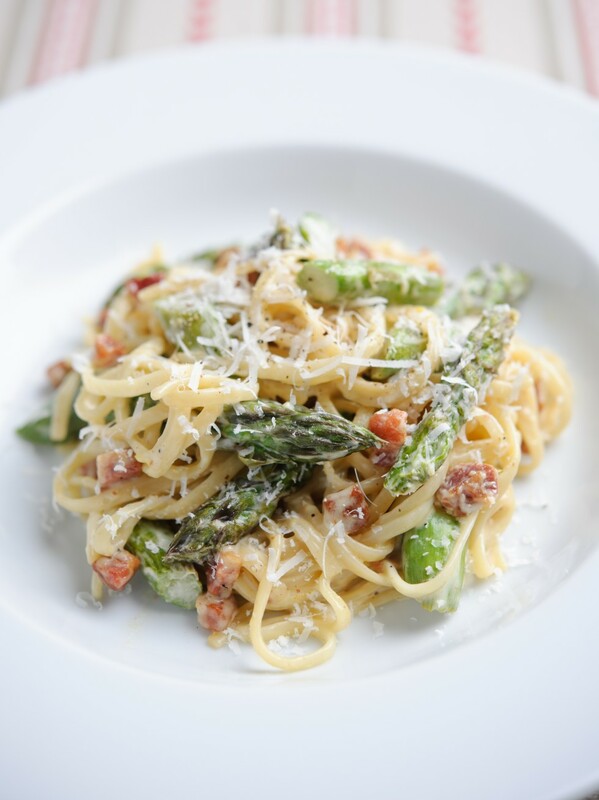 Grill the asparagus and bacon on both sides until golden and cooked. 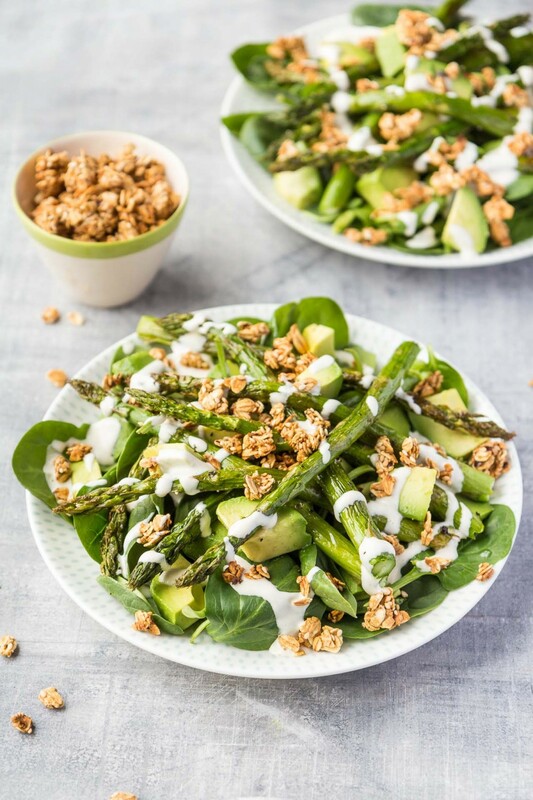 Return the asparagus to the oily plate and roll it in the dressing once more. Toast the cut sides of the buns. 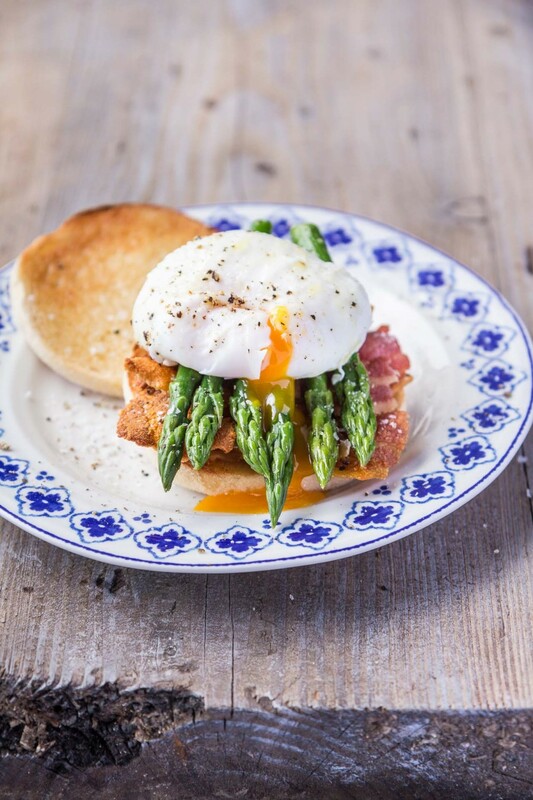 Cut the asparagus spears in half to fit into the buns. 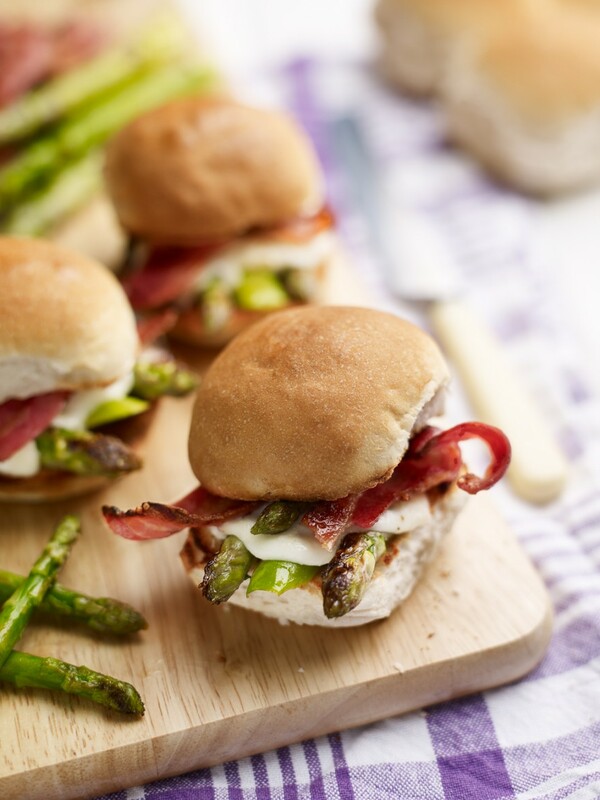 Top one half of each bun with asparagus then a slice of mozzarella. Return to the grill to melt the cheese. Cut the bacon to fit the buns then top each slider with a crisp piece of bacon and the top half of the bun.